What was it like when your child started reading? Did they enjoy reading books? At a very young age, my daughter Katie loved to read. She would pick up a book and try to tell us the story. She would either remember what the story was about by us reading it to her or she would make up a story by what she saw on the pictures. Couple of her favorite books were Better Not Get Wet Jesse Bear and Better Get Dressed Jesse Bear. These were actually my books from when I was in elementary school. Katie would read these books over and over again. The video below is of Katie when she was 2.5 years old reading Better Not Get Wet Jesse Bear (with Sophia talking in the background). I love her excitement in her voice while she’s reading. Last year Katie and I worked on learning some sight words together. I could take out the sight words flash cards and she was able to read words that we haven’t even learned yet. Now this year, Katie is in Kindergarten. She has been practicing words, writing, spelling, and reading in her class. As we were in stores, such as Target or Barnes & Noble, Katie would read some words she saw. Last week, we read Katie’s library book, Pete the Cat and the New Guy, she checked out from the library at school. 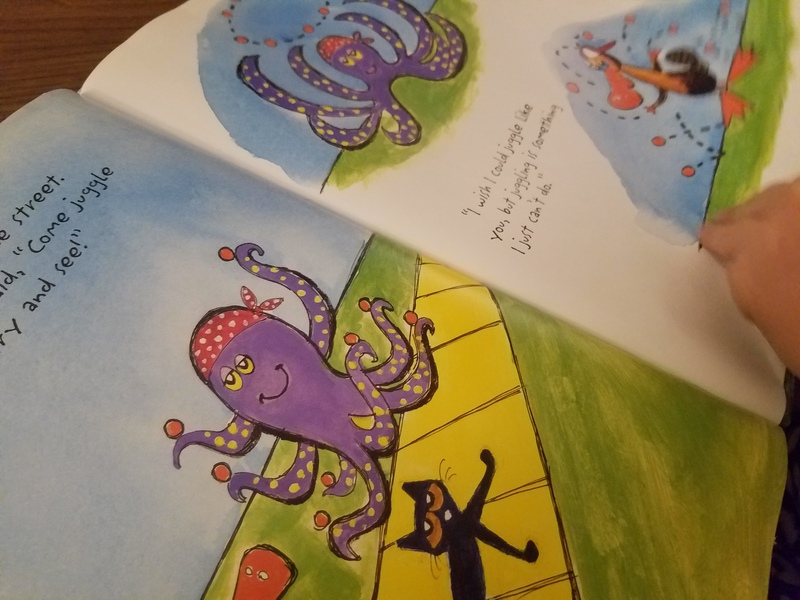 After we read the book, I started reading a book my daughter Sophia picked. 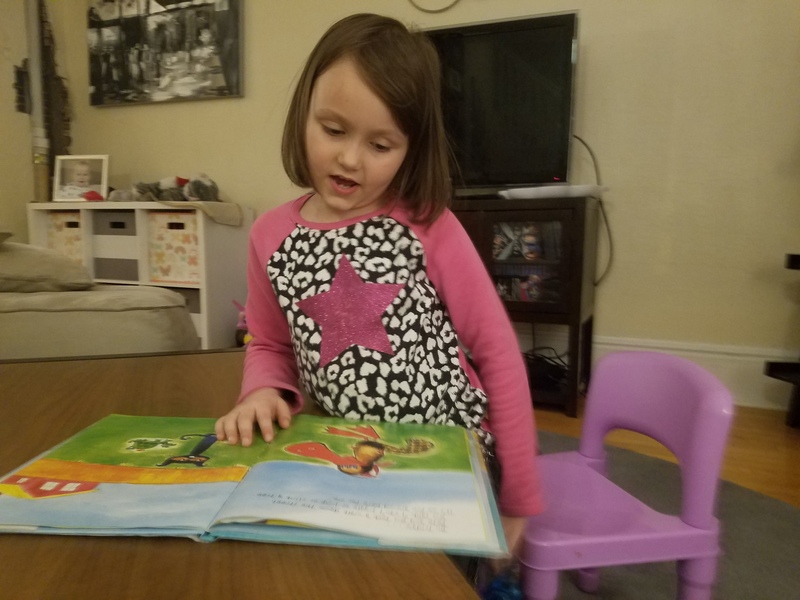 While we were reading, Katie picked up her library book and started reading it by herself. I followed along with her while she was reading her book. There were some words she stumbled on, so I covered up part of the word and had her sound the word out. She did great! We were pretty proud. And we still are. 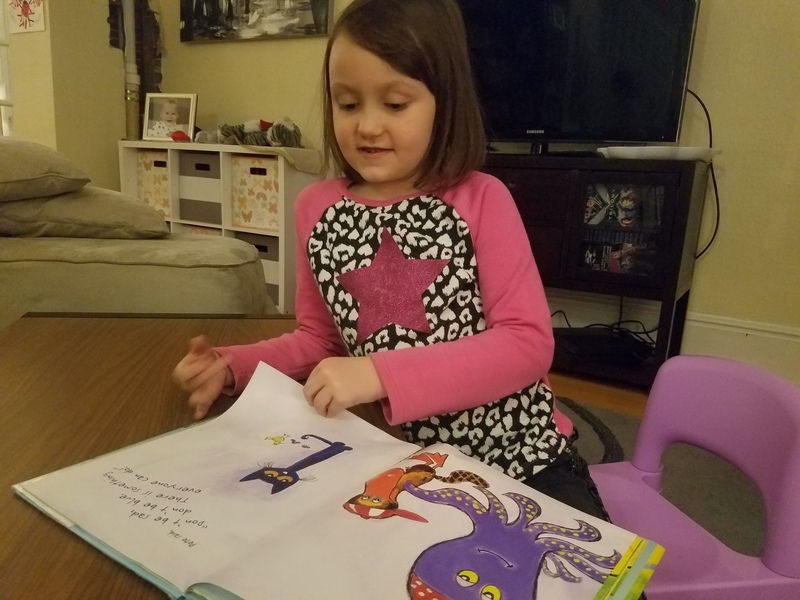 Here is a video of Katie reading one of the pages in the book. This month at Katie’s school, they are focusing on reading. Each student has to keep track of how many minutes they read each day. At the end of the month, whoever has the most minutes gets a prize. Also each Friday during the month is a dress up day. This past Friday, students had to wear shirts that kids could read. This Friday’s theme is cheers for reading (wear your favorite team). Katie had homework this weekend. She had to read us a book to us. She read Can You Spot It? Katie also read her new library book she checked out at the library. She read the book Fancy Nancy all by herself. We got in 35 minutes of reading! I’m so glad Katie loves reading and is interested in learning more words. 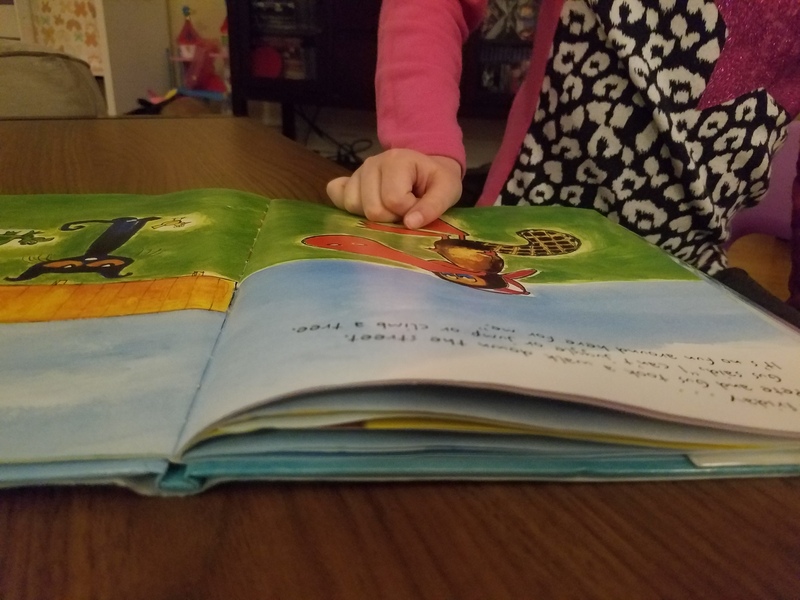 Do your kids consistently have a book in their hands? What books are your kids enjoying reading? I am struggling to teach my second child to read. Some days she does great. Others she just will not concentrate and makes the “l” sound while looking at a “w”….sigh. So great that you’ve made it so far in your reading journey! Lovely post! So cute! I bet she is enjoying it. My oldest child is learning his letters and is becoming more interested in learning them, thankfully! He has always loved books and enjoys being read to! Followed you on Pinterest! So adorable! Reading is one of my favorite milestones!!! My kids always have books in their hands! 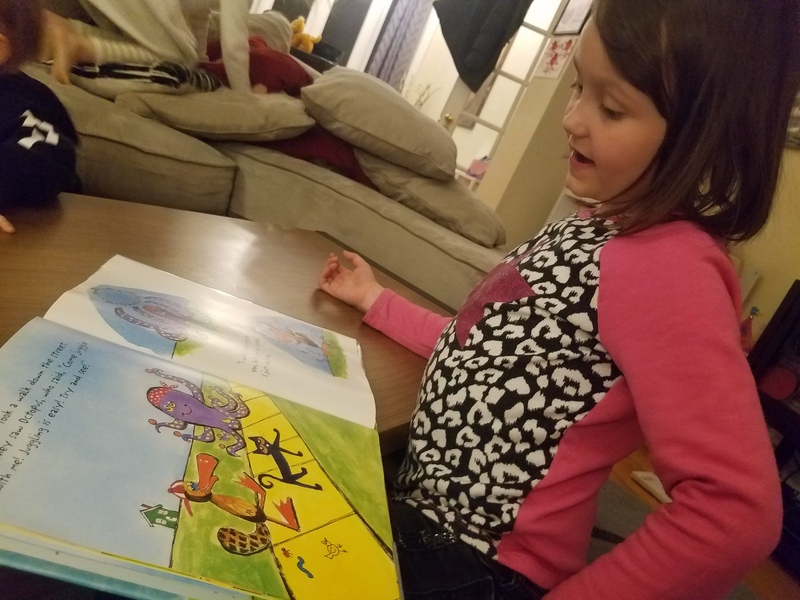 My teen loves Harry Potter, my preteen loves Diary of A Wimpy Kid, my 6-year-old loves Junie B Jones and Babysitters Club, and my little ones (3 and 1) just love me to read any and everything to them.Great post! This is great! She looks like she’s enjoying it. 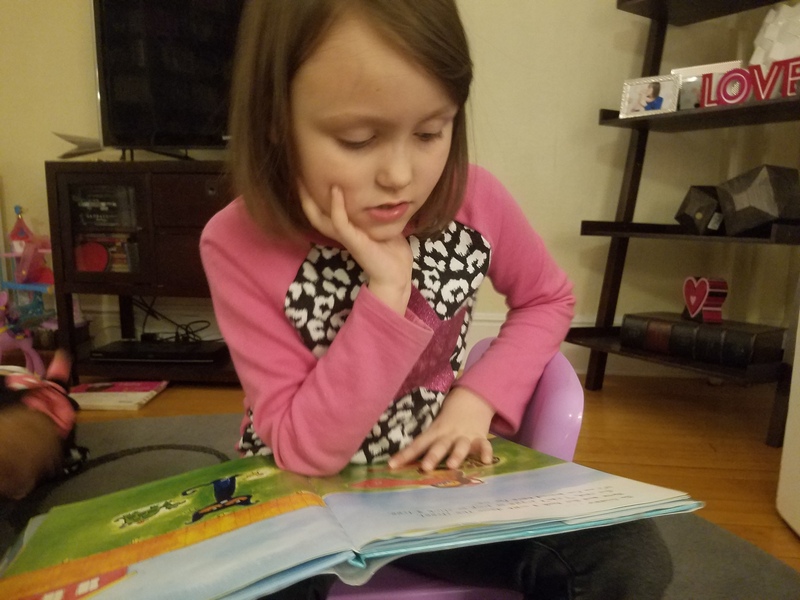 Love that her school is focusing on reading for the month. Childhood literacy is so important! My Little Man is just starting to read. Our kids have always loved books. Awe so cute!! Love that she’s a reader and is such a fan of books! Aww, that is so exciting! I was like that when I was little, and now my son is starting to get better and better at reading and I love hearing him! My son is still young, but he loves books so when the time comes I am sure he will do great!! That’s so awesome that she enjoys reading. Both my boys love books as well. Thanks for sharing. This is so cool! I thought about doing sight reading with my preschooler. Glad to know it helped for kindergarten!